Chiropractic care is delivered in many ways. The most effective way we have found to restore, revitalize, and continue to grow a high level of health is through customized care plans. 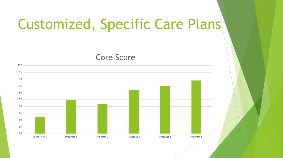 The care plans that our practice members participate in are designed specifically from the evidence we gather from the thorough consultation and examination on the initial visit, and are tailored as we go with the help of regular progress examinations to ensure the best care and results possible. During the initial assessment, Dr. Grier customizes the examination to fit the needs of the person, utilizing highly trained hands, nervous system scanning technology, photographic posture analysis, and digital x-ray as indicated to get most well-rounded view possible of a person’s health. With this approach it is common for us to see profound results with people when other medical or chiropractic approaches have failed. We routinely see a return to health and vibrancy in children who have been dealing with chronic ear and sinus infections, sleeping problems, digestive challenges, and behavior issues. We also see health return to people whose lives have been interrupted by chronic pain syndromes, headaches, and issues like high blood pressure, insomnia, and general poor health. While having fewer symptoms is wonderful, it is really the return to living a happy, productive, and enjoyable life that is the true product of a well-constructed and delivered chiropractic care plan. While many are used to a chiropractic approach that is limited to focusing on the symptom a person has, essentially receiving adjustment and being told to come back if the problem persists, we take a much deeper look because we know people were designed to be vibrantly healthy, and symptoms are just one way our bodies can tell us that all is not well.